The story of David Dann and his wife, Susan, reads like an episode from Upstairs Downstairs, Downton Abbey or some other Edwardian melodrama. 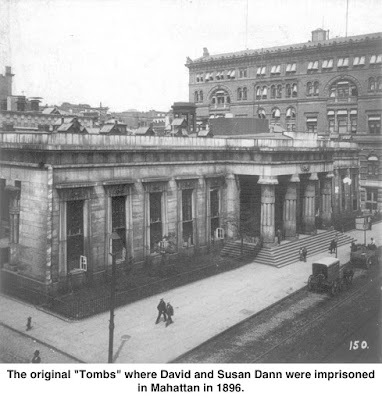 Susan, a maid in the home of a rich New York City banker, was accused by her employer of thievery, and thanks to incompetent police, she and David were both thrown into Manhattan’s notorious “Tombs” prison, eventually rescued by a wealthy lawyer and future candidate for governor of Connecticut. David Dann was born on a Ridgefield farm in 1873, a son of Levi Dann, who was a Civil War veteran and well-respected local citizen. In the summer of 1895, a young Irish woman named Susan Lyons was visiting in Ridgefield and met David, then working as a house painter. They fell in love and David followed Susie to New York City where she worked as a servant in the Broad Street home of Maurice B. Wormser, a prominent Manhattan banker. They were married soon after but kept their marriage secret, an arrangement that contributed to their arrest. On the evening of Saturday, Jan. 18, 1896, Maurice Wormser played host to his brother and his brother’s wife. Around 10 p.m., as the couple was about to depart, the brother asked to see an evening newspaper, which was in the dining room. “I went into the room to get it and found the silverware drawer open,” Wormser later testified in court. “I thought nothing in particular of this, but then at 10:45 two servants saw Susan Dann, who was known as Lyons, a waitress in our employ, in the dining room with a big tray of silver, which she was sorting over. The house was then locked up and the burglar alarm set.” The two servants were named Amelia and Minnie. At 8:30 the next morning, Susan Dann reported to Wormser that the silver had been stolen. “She said she discovered this when she had returned from mass,” Wormser testified. However, the cook, a Mrs. Ebert, had told Wormser that Susan was seen admitting the baker at 7:45 a.m. and had also been seen at 7:15 in her nightclothes when Mrs. Ebert had dealt with the milkman. That prompted Wormser to question Susan about how she could have had time to go to mass. She admitted lying about going to mass, however, and had instead gone for a walk with her husband. She said lied because she did not want Wormser to know she was married until her husband had found work in the city, in case she might lose her job. “I know they say the house was locked, and that the basement gate was fastened,” she said. But when she returned from her early morning meeting with her husband, she found the gate open. “And that was not the first time I have found it open,” she said. She also told a New York Herald reporter that Amelia’s and Minnie’s statements that she was handling the silver late Saturday evening were false. Adding to the suspicion surrounding the Danns was the fact that Nellie Lyons, Susan’s sister, visited the Wormser house Saturday evening. Nellie at first denied she had been there, but later admitted she had indeed paid a visit to her sister. The police suspected the Danns in part because of the lies Susan and Nellie told. Detectives used Amelia, the servant, to identify Nellie Lyons as the woman who visited the house Saturday and, Amelia maintained, several times in recent months. 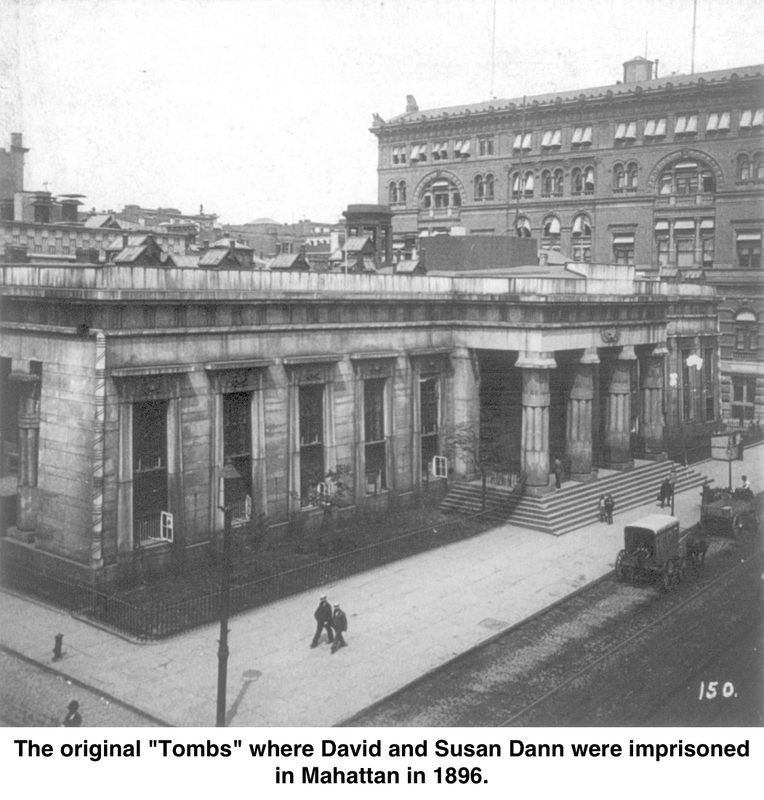 Both Susan and David were taken to the precinct station house where they were questioned and eventually arrested, and sent to the city prison, known as The Tombs (today’s city prison, the fourth edition of the facility, is still nicknamed The Tombs). Because Nellie had lied about being at Wormser’s Saturday, police arrested her on a charge of complicity in the theft. However, police also suspected her because the house in which she worked as a cook had been robbed by a masked man several weeks earlier after the owner had been put to sleep with chloroform. Meanwhile, Mrs. Ebert, the Wormser cook, identified David Dann as a man who had come to the house about 10 days earlier. Posing as a plumber, she said, he went through various rooms in the place. Though nothing was taken, it was just one more alleged event that was suspicious. Alas for Casey, that never happened. Word of the arrests quickly reached David’s hometown. “It is said in Ridgefield by a good many people that David Dann, who has been under arrest in New York with his wife on a grave criminal charge, has always appeared to be a quiet, inoffensive young man, and people here cannot believe that he would go wrong,” the Ridgefield Press reported. Levi Dann, David’s father, quickly began seeking support for his son and daughter in law. A Catholic, he approached Father Richard Shortell, popular pastor of St. Mary’s Parish, who helped gather statements about David’s character. residence in Ridgefield. Levi approached Cary about helping his son. Cary immediately wired Father Shortell, saying the imprisonment was “an outrage,” and maintaining he would procure David’s release as soon as possible. Melbert Brinckerhoff Cary was a good man to have on your side. A Princeton graduate who practiced law with a leading Manhattan firm, Cary was also a writer, whose books included The Connecticut Constitution (1900) and The Woman Without A Country. 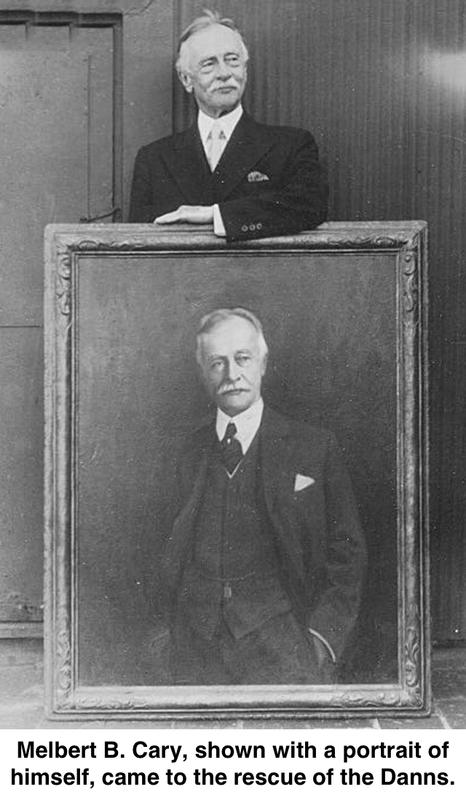 In 1902, Cary ran for Connecticut governor on the Democratic ticket—he had been chairman of the Democratic State Central Committee for several years. He lost to a Meriden Republican, but remained a power in Connecticut politics as well as influential in Ridgefield goings on. He died in 1946 at the age of 93; at the time he was the oldest living Princeton alumnus. 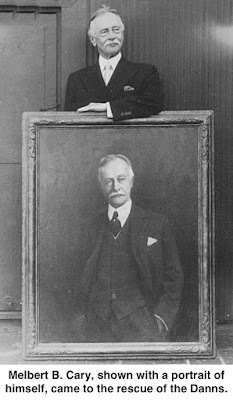 Levi collected a large number of testimonials from Ridgefielders, endorsing his son’s good character, and turned them over to Cary. “Mr. Cary was zealous in his endeavor to free these innocent persons,” the Press said. After those 10 days under arrest, the three suspects were “liberated from the Tombs,” as the Press put it. A grand jury found no evidence to support the arrest of the three. Then, on Tuesday night, “Detective Herlihy came up and told me my sister was drunk down in the police court, and that she had said I stole the silver and had told where half of it was. They took my husband and me down to the station that night, and said we wouldn’t be detained, and when they got us there, they locked us up. Detectives and the matron came to me about every fifteen minutes and kept asking me insulting questions and telling me I was lying and try to make me confess that I was a thief. Melbert Cary not only got the Danns freed from prison, but also sued Susie’s employer. Cary blamed Wormser for convincing the police that she should be arrested. He sought $20,000 damages (around $575,000 today) for each of the three people imprisoned. It seems unlikely, however, that much if any money was awarded; perhaps there was an out-of-court settlement for a small amount. Four years later, David Dann was working as a janitor. By 1910, he was painting houses in Rye, a town in lower Westchester County, New York, where he and Susan rented a house. They had four children by then.